Ironically, the most unequal and dystopian of societies are often founded on utopian principles. Utopias, almost by their very nature, are oppressive. From Plato’s Republic of strict castes and rampant censorship to Thomas More’s Utopia of puritanical laws and slavery, a utopia for the few is often a dystopia for the many. The question then arises: How do the benefactors of utopia confront its detractors? Utopia has several choices. It can maintain its monopoly on media and education, strangling nascent free thought before it grows into free action. Or… It can physically punish and oppress free thought, which requires systems to detect and punish dissent. Detection requires gathering information about the populace. Punishment requires control and physical torture: the police, the army, and the prison. Ironically, to maintain power, utopia often adopts trappings of dystopia. Despite the seeming differences between them, most dystopias share one common trait: they resemble the panopticon, a model of the ideal police state. In fact, panopticon, dystopic police state, and utopian society share common goals: total observation, total power, and unquestionable control. The panopticon models the workings of a society. The panopticon was initially an architectural concept for the ideal prison. Conceived in 1791 by Jeremy Bentham, a social reformer and utopian thinker, the panopticon embodies the ideals of observation, control, and discipline. In its physical form, the panopticon is a circular prison with cells ringed around a central tower from which prisoners can be watched at all times. This slender central tower contains a covered guardroom from which one guard simultaneously surveys hundreds of prisoners (see diagram below). The panopticon aims for constant surveillance and prisoner discomfort. In this all-seeing system, dissent is detected and discipline is enforced. The panopticon is also a system of ingrained injustice. In Discipline and Punish, a 1975 treatise on the origins of the modern prison, author Michel Foucault describes the absence of real communication in the panopticon, “He [the prisoner] is seen, but he does not see; he is the object of information, never a subject in communication. The arrangement of his room, opposite the central tower, imposes on him an axial visibility; but the divisions of the ring, those separated cells, imply a lateral invisibility” (Foucault 200). The panopticon is defined by visibility, or the lack thereof. The guard sees the inmates, but the inmates see neither the guard nor each other. In this unbalanced relationship, there is unhindered visibility between center and periphery, guard and prisoner. But, there is not comparable visibility between prisoners; they are firmly divided. Whereas in the panopticon, this is a physical arrangement of walls, windows, bars, and brute force, in dystopian society, this is a metaphysical or political arrangement where the government values control and observation over communication between citizens. The panopticon is more than a structure; it is a model for the workings of the dystopic police state. Foucault describes the panopticon’s practicality, “Whenever one is dealing with a multiplicity of individuals on whom a task or a particular form of behaviour must be imposed, the panoptic schema may be used. It is – necessary modifications apart – applicable to all establishments whatsoever” (205). The panopticon and the police state are the ideal systems of control for three main reasons. Firstly, both control a “multiplicity of individuals.” In the panopticon, one guard watches hundreds of prisoners. In the police state, the powerful few watch the powerless many. Secondly, both impose “a particular form of behavior.” In the panopticon, this behavior is penitence and fear of observation. In the police state, this behavior is obedience to the government, its social norms, and its interests. Thirdly, both are systems of enforced inequality where prisoner and citizen are watched with neither their approval nor their knowledge. In both systems, control is simultaneously anywhere and nowhere. Anywhere: the state is all knowing. Nowhere: its power is implacable. In this way, the power of the panopticon translates into the power of the police state. Though specific methods may vary from panopticon to police state, their objectives are the same: to centralize power, to manipulate the citizen, and to ensure order. Panopticon and police state are tools for psychological control. The panopticon exhibits three forms of power. Firstly, there is the power of the architecture: walls, windows, doors, and bars. Secondly, there is the power of the intendants: the panopticon’s guards and the police state’s bureaucrats. Thirdly, there is the psychological power that stems from the latter two forms: the “power relation” in which the inmate is its “bearer.” Desire to avoid possible detection leads the inmate to self-censor her behavior. Desire to avoid possible punishment leads the inmate to suppress her instincts. Only then does the pernicious system triumph; the individual oppresses herself independently of direct coercion. In other words, panopticon and police state use physical power for psychological ends. The panopticon as psychological tool is also explored in Margaret Atwood’s novel The Handmaid’s Tale. Offred, the protagonist in the theocracy of Gilead, describes the anxiety and fear she feels daily. When the commander’s chauffer merely winks at her, she wildly speculates: “Perhaps it was a test, to see what I would do. Perhaps he is an Eye” (Atwood 18). When attending a religious service, Offred warns herself: “We’re on the sidewalk now and it’s not safe to talk, we’re too close to the others and the protective whispering of the crowd is gone” (223). When meeting a new handmaid, she censors herself: “I should give it a week, two weeks, maybe longer, watch her carefully, listen for tones in her voice, unguarded words” (284). Anyone could be an informer. Anyone could be an Eye of the state. Anyone could turn you in. In every situation, one must guard one’s body, one’s language, and one’s thoughts for fear of detection. In Gilead, so pervasive is this culture of fear that the individual becomes the “bearer” of her own “power situation”, like Offred. By infiltrating society with informers and by brainwashing its citizens, the resulting culture of fear ensures obedience to the theocracy. Both 1984 and The Handmaid’s Tale demonstrate panoptic principles. Though actual observation may be discontinuous, fear of observation is continuous. And, this constant fear of observation produces self-censorship, which, according to Winston, is a “habit that becomes instinct”. Consequently, the panopticon’s monopoly on the body gradually becomes a monopoly on the mind. It indirectly controls the mind by directly controlling the body. Panopticon and police state suppress communication. In Oceania, Big Brother government controls all communication. Through Newspeak, the system “simplifies” language at the expense of creative writing. Through censoring words such as freedom, equality, and justice, it purges the citizen’s mind of revolutionary ideas. Through suppressing sexual expression, it transforms sexual tension into hate for enemies of the state. Through monopolizing media and education, it ensures that communication occurs through the “appropriate channels.” Through brainwashing the minds of the young, it creates citizens who will blindly obey the system. Similarly, in Gilead, government control of social norms impedes communication between individuals. When Offred goes on her daily walks with a fellow handmaid, their conversation is limited, regimented by socially acceptable phrases like “Praise be” or “Blessed be the fruit.” When individuals from different classes pass each other on the street, they spit, glare, and stare, envious of each other’s government-granted privileges and clearly “different” from each other, as proven by their government-granted uniforms. When in bed, government dictates the socially acceptable coital position. When speaking, one must guard one’s words. Anyone is an informer. Everyone is watched. Government power is omnipresent, from the sidewalk to the bedroom. And, punishments for human communication and self-expression are draconian: public shaming, prison, or even death. Clearly, the theocracy of Gilead values its monopoly on power over honest communication between people. As Virginia Woolf writes, “He who robs us our dreams robs us our life.” In the name of enforcing discipline, the panopticon robs society of her dreams, her freedom, and subsequently her life. Revolution stems from the right to hope, dream, and communicate. Without dreams, there is no communication. Without communication, there is no revolution. Kill the dream, cut the communication, and the panoptic system will prevail. The panopticon realizes the ideals of an autocratic and all-knowing police state. The autocratic system, in its many forms, relies on injustice. According to Foucault, “[the panopticon] is a machinery that assures dissymmetry, disequilibrium, difference. Consequently, it does not matter who exercises power. Any individual, taken almost at random, can operate the machine” (Foucault 202). In the ideal autocracy, the system is self-perpetuating. As already discussed, the citizen becomes the “bearer” of her own oppression. But, the state also starts to function independently of its operators. This consequently insures control and order, two of the primary tenets of autocracy. The panopticon is the ideal autocratic police state for several reasons. It reduces the number of people needed to exercise power, ensuring that a dedicated minority controls a complacent majority. It predicts revolutionary thought before it becomes revolutionary action because it is all seeing. Its strength is one that never intervenes; the system acts independently of its operators. Ironically, the perfection of power renders its actual use unnecessary. Utopian endeavors often lead to dystopic panopticons. Utopia must make concessions to reality. Nathaniel Hawthorne describes: “The founders of a new colony, whatever Utopia of human virtue and happiness they might originally project, have invariably recognized it among their earliest practical necessities to allot a portion of the virgin soil as a cemetery, and another portion as the site of a prison.” Utopia concedes to reality. The graveyard is an acceptance of the fragility of life and the inevitability of death. The prison is a concession that all societies, no matter how perfect, will have victims and revolutionaries. As Atwood warns: “Better never means better for everyone. It always means worse for some” (Atwood 211). Ultimately, utopia is forced to reconcile contradictory aims: the freedom utopia promises vs. the oppression it delivers, the collective spirit utopia promises vs. the collective misery the panopticon creates, and the ideals of utopia vs. the realities of human nature. Seemingly peaceful utopia cannot ignore these glaring contradictions; these contradictions undermine utopia leaders and legitimacy. Consequently, to maintain its semblance of perfection and peace, it often adopts the most dystopian of institutions: the prison. The prison, be it physical or psychological, is utopia’s dystopian tool. Plan for the factory and community at Act et Senans in France, designed in 1771 by Claude-Nicolas Ledoux. Note the panoptic arrangement. The factory is above the semicircular courtyard. The worker housing is ringed around the semicircle. The intendant’s office is at the top, in the center. From his office, he can survey his workers in panoptic fashion. Ledoux envisioned his factory as a self-contained utopia. Dystopic panopticon or utopic society? Arc et Senans is both. Both utopia and dystopia contain elements of each other. In Utopia, an essay anthology, Frédéric Rouvillois writes: “On the one hand, the most blatant utopias, with their obsession to rehabilitate man and condemn him to happiness, do indeed reveal traits that we habitually attribute to totalitarian systems. On the other hand, totalitarian systems – Fascism, Nazism, Stalinist or Chinese Socialism – even when they don’t acknowledge the connection, invariably remind us of utopias, whose goals, mottoes, and means the appropriate” (Schaer 316). Although utopia espouses noble ideals, it often realizes them on the tip of a metaphorical bayonet. The individual is “condemned to happiness”, systems of surveillance impose an oppressive peace, and the stability of the state is valued over the autonomy of the individual. Indeed, utopia exists primarily as an ideal whose every manifestation is totalitarian and dystopic. The word utopia is doublespeak for all that it claims to stand for: “the perfectibility of man [and woman]”, the creation of happiness, and the protection of liberty. As Orwell writes, “Inequality was the inalterable law of human life” (Orwell 202). Despite its best efforts, utopia is marked by inevitable inequality. Humans, by their very nature, are born with different outlooks and attitudes. Utopia, by its very nature, prescribes one outlook and attitude to all, regardless of circumstance. The interests of the individual and the demands of utopia will conflict. One must prevail, the individual or the system. The panopticon emerges; the system prevails. Foucault differentiates between the spectacle of the past and the panopticon of the present. In the spectacle, the many observe the few, be they actors or gladiators. In the panopticon, the few observe the many, be they wardens or doctors. They are different systems of control; while a collective spirit of “sensual proximity” and communication defines the spectacle, individualization and isolation defines the panopticon. Foucault claims these two systems are polar opposites. Yet, does this disconnect between spectacle and panopticon still exist in contemporary society? Discipline and Punish was written before all-inclusive government spying on its citizens and before our digital age of the internet. Today, unlike in Foucault’s time, the panopticon is part of the spectacle. On the one hand, the spectacle of creates conformity and groupthink, through the currency globalization, the proliferation of digital entertainment, and the spread of generally Eurocentric social norms. On the other hand, the panopticon is ingrained in the technology of the spectacle: the computer, the cellphone, and the credit card. To name a few, Google provides one’s search history, Facebook describes one’s personality and preferences, and credit card transactions reveal one’s purchases. The panopticon thrives off of the spectacle of technology. Therefore, the two are no longer disconnected entities from separate eras, as Foucault claims. Rather, in our modern society, they are almost interchangeable. According to Foucault, the panopticon “augments” or realizes the human thirst for power. In doing so, it exposes humanity’s darkness: the desire to control others in body and mind and the desire to seize and maintain power by any means whatsoever. In other words, the panopticon permits the prosecution of thoughtcrime. Naturally, the frightening darkness of panopticism is only “only grudgingly acknowledged” for when one stares at the panopticon, the darkness and depravity of human nature stares back. Granted, we do not live in a full-fledged panopticon. But, disconcerting parallels between panopticism, dystopian society, and our post 9/11 culture are emerging. As Edward Snowden’s heroic struggle reveals, the panopticon is not as impossible as it appears; government has the technology, the means, and the desire to create the panopticon. It needs only the public’s tacit indifference and silent nod of approval. As citizens of the panopticon, what power do we have over our rights, our freedoms, and our futures? The police state has many manifestations in societies founded on utopian principles: the Stasi of East Germany, the NSA of America, the Gestapo of the Third Reich, the State Security Department of North Korea, the Eyes of Handmaid’s Tale, and Minipax of 1984. The list runs on. Ironically, Bentham popularized the phrase “the greatest good for the greatest number.” In reality, the panopticon creates the greatest power for the fewest number. Obedience also strengthens panopticon and police state. Fear of the system induces obedience to its demands. Ceausescu, Stalin, or Hilter could never have risen to power without the public’s tacit approval of their crimes. Fear and helplessness fuels tyranny. Bentham writes, “Among schoolchildren, it [the panopticon] makes it possible to observe performances (without there being any imitation or copying), to map aptitudes, to assess characters, to draw up rigorous classifications and, in relation to normal development, to distinguish ‘laziness and stubbornness’ from ‘incurable imbecility’” (Foucault 203). Atwood, Margaret. The Handmaid’s Tale. 1st ed. New York City: Anchor, 1998. Print. Foucault, Michel. Discipline and Punish: The Birth of the Prison. 2nd ed. New York City. Vintage Books, 1995. Print. Ledoux, Claude-Nicolas. Plan de la Saline de Chaux. Digital image. Wikipédia. 18 May 2007. Orwell, George. Nineteen Eighty-four. New York City: Signet Classics, 1977. Print. Schaer, Roland et al. Utopia: The Search for the Ideal Society in the Western World. 1st ed. Oxford, England: Oxford University Press, 2000. Print. The former Essex Country Jail sits forlorn and abandoned amidst desolate parking lots and lifeless prefab boxes. In the so-called University Heights “neighborhood,” the jail is testimony to the past. Listed on the National Register of Historical Places, this 1837 structure is one of the oldest jails in America. Abandoned for over thirty years, no successful preservation efforts have materialized. Gradually, the urban jungle of junk trees, vines, and garbage conquers the veritable old fortress. The warden’s garden that zealous prisoners formerly pruned and weeded is now overrun with weeds. Used syringes line the cell-block floors. Not a single window is unbroken. Not a single wall is straight or strong. The rigid geometry defined this urban castle is now blanketed in decay. Yet, this fortress of old is still a home. A constant trail of homeless squeeze through the rusted barbed wire fencing. They carry with them their few odd “valuables,” cans to be recycled or shopping bags of discarded clothes. Every night, they sleep in the very cells their luckless brethren slept in decades before. Every day, they aimlessly wander city streets. Ironically, the physical prison of brute force and searchlights has evolved into a metaphorical bastion of poverty. Both prisons, new and old, are refuges for the luckless. As its occupants have changed, so has the prison. Both are ghosts. Both are vanishing. I am often aghast when I walk through downtown Newark. The corporate towers of the “Renaissance” Center ignore the very city that gave them millions of dollars in tax breaks. 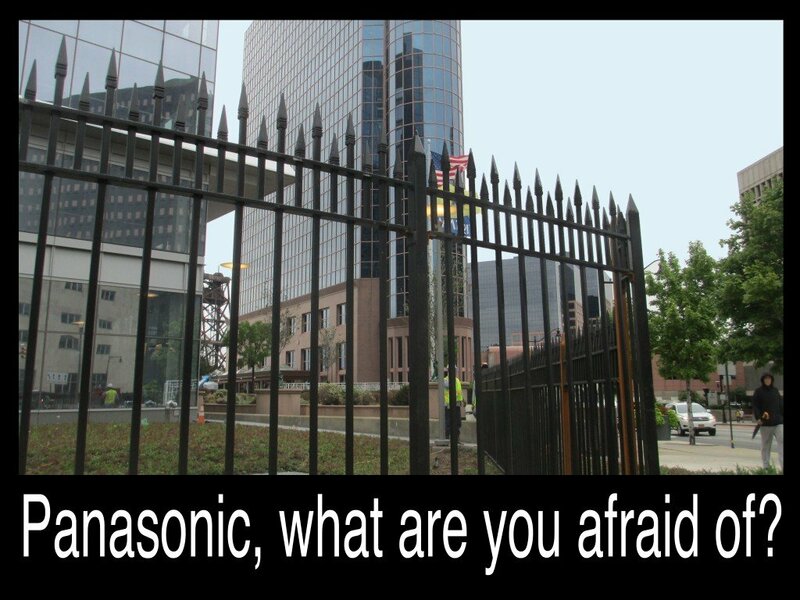 They erect austere metal fences and protect their towers with zealously obedient “security” guards. They are scared of Newark. Ironically, they shun the very hand that fed them. When Panasonic decided to move their national headquarters to Newark, I hoped they would buck the trend of icy disrespect. But, I saw that their new building turned its back to the city like all the other lifeless behemoths downtown. I wrote the following petition, signed by Newark children during the opening of Riverfront Park. On June 11, 2012, when the Central Planning Board asked Panasonic to open their grounds for public access, I read my petition. There was once a “selfish giant” who had a most beautiful but closely guarded garden, where, to his dismay, all the little children were found playing. Scaring the children away angrily, he built around the garden a high wall, with a sign: “Trespassers will be prosecuted.” Children could no longer go in to play, but dreamed about all the fun behind the wall. With the children’s absence, the trees never blossomed again, the animals disappeared, and the garden was always barren. The selfish giant no longer heard the birds or smelled the spring air. Then, one day, to the giant’s amazement, the garden was in blossom again. From the window of his fortress, he saw the children had crept through a hole in the wall to play in the garden again. Finally, the spring had melted his icy heart. The giant “took an axe to knock down the wall,” and played with the children in the beautiful garden. When you moved to Newark, we were hoping to have a socially responsible new neighbor. We expected your home to be different from the corporate winter gardens we have often seen here. As your glassy home steadily rose, we were mistaken. Surrounding the building, a tall metal fence with spearheaded points rejects the surrounding world and separates the lonely giant from the city. Strategically located at the gateway to our city’s newly energized waterfront, the Panasonic winter garden, however, tells a story of the giant in the fortress, his feebleness, his fear, and, most of all, his old urban biases. We, the children, who were born and grow up in the surrounding neighborhoods, ask you, the giant, to “take an axe and knock down the wall,” and to open your garden to Newark and its people. As a neighbor, this is the least you can and should do. This petition and the poster above were featured in a June 2017 exhibition about about planning and urban policy. The exhibit was organized by Damon Rich, former planner for the City of Newark, and exhibited at the Yuerba Buena Center for the Arts.